Old chassis, new technologies. 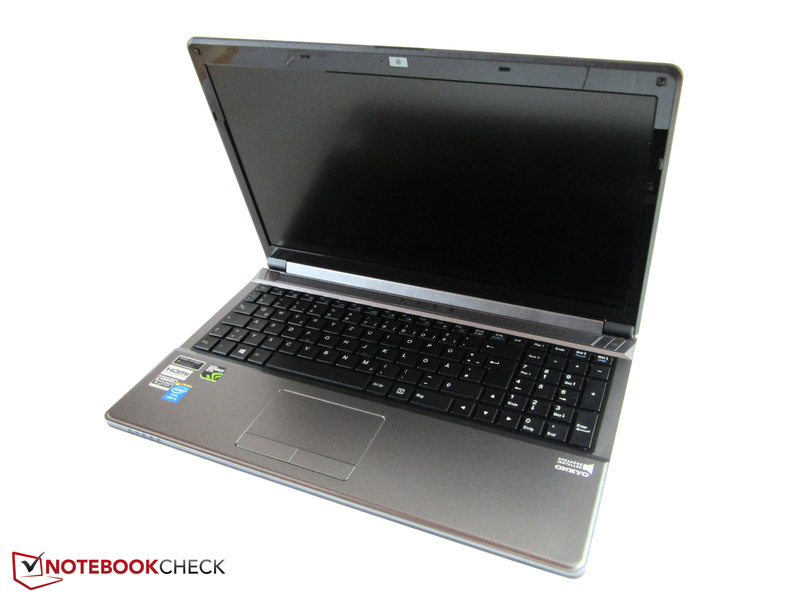 Buyers looking for a speedy gaming laptop that does not excessively burden their wallet might find something at Schenker Technologies. The base configuration of the XMG A504 with a GeForce GTX 860M "only" costs 949 Euros (~$1305). 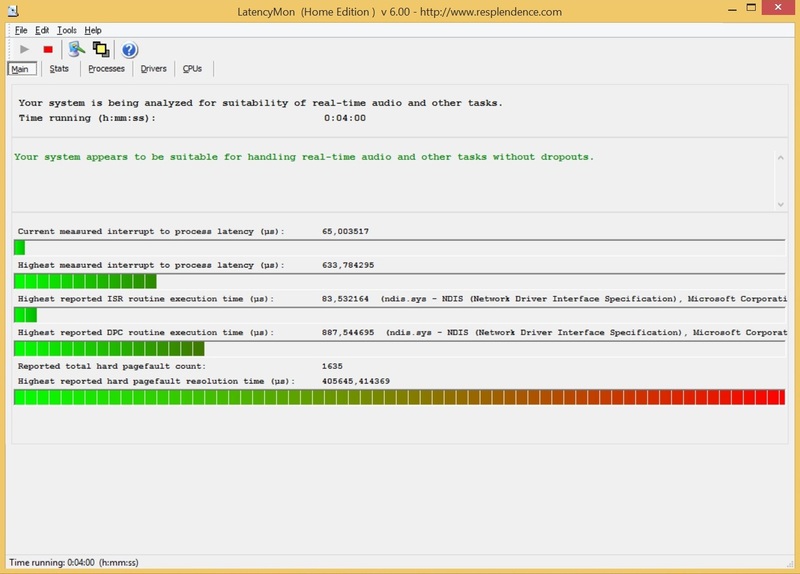 We sent a somewhat lusher version through our benchmark tests to answer pressing performance questions. 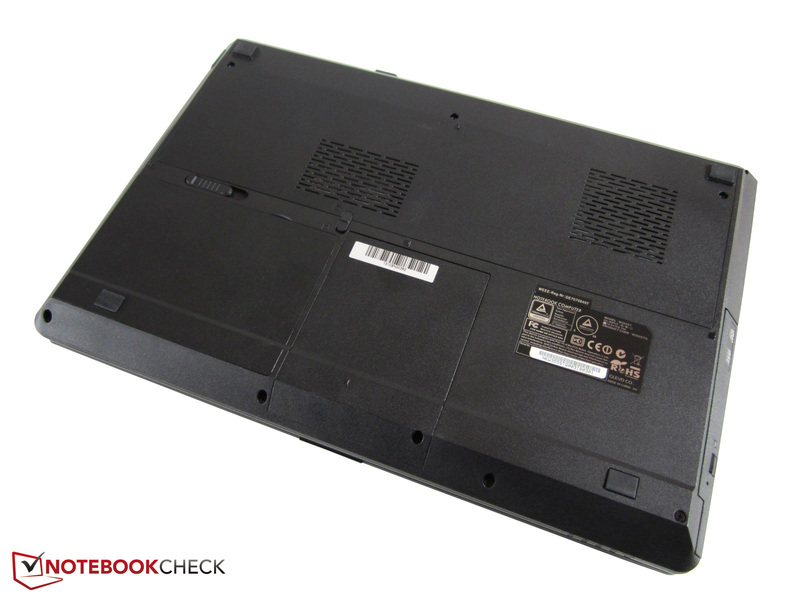 The biggest advantage of barebone-resellers like Schenker is the high flexibility. Unlike other companies, such as Toshiba, MSI, Gigabyte etc., specified hardware combinations are not forced onto buyers - no matter how many models the manufacturer offers. 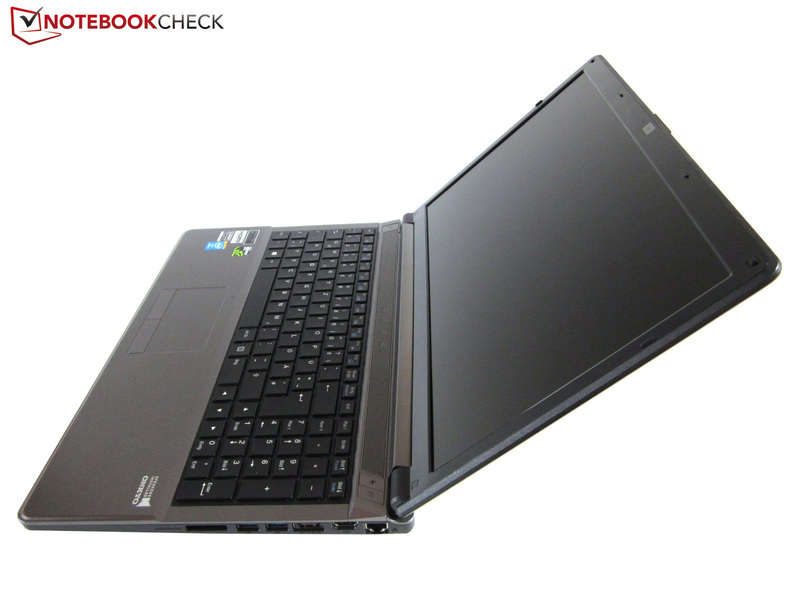 The 15-inch XMG A504 is very upgradable and expandable. The first decision is choosing the screen. 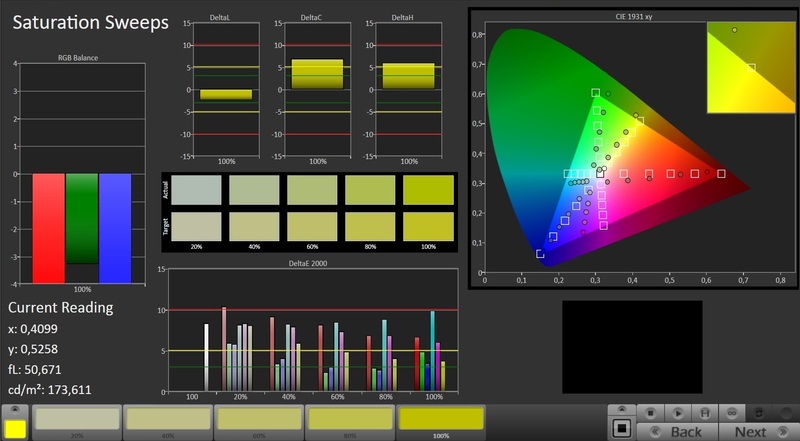 Besides a "conventional" Full HD screen, Schenker also offers a model with a better color space (allegedly 95% gamut). 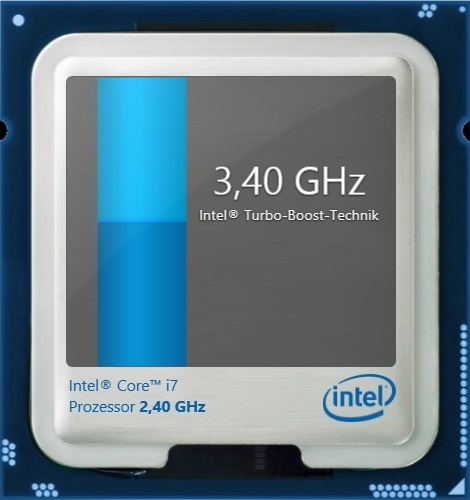 There are even more options in the processor category: Starting with the dual-core Intel Core i5-4200M (2.5 - 3.1 GHz) up to the quad-core Intel Core i7-4910MQ (2.9 - 3.9 GHz) - almost all CPUs of Intel's Haswell generation are present. 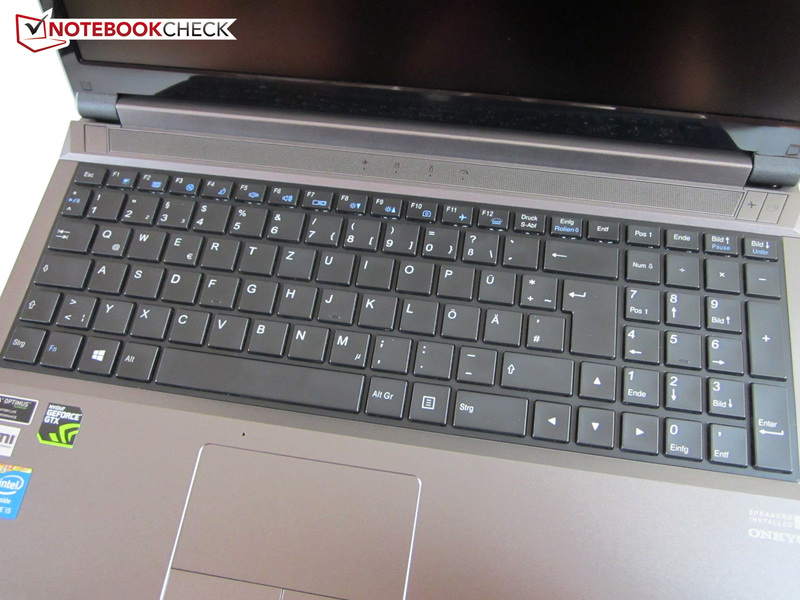 The laptop can cope with a maximum of 24 GB RAM owing to three DDR3 RAM banks (1 under the keyboard, 2 in the base). We believe the most exciting thing is the hard drive configuration. 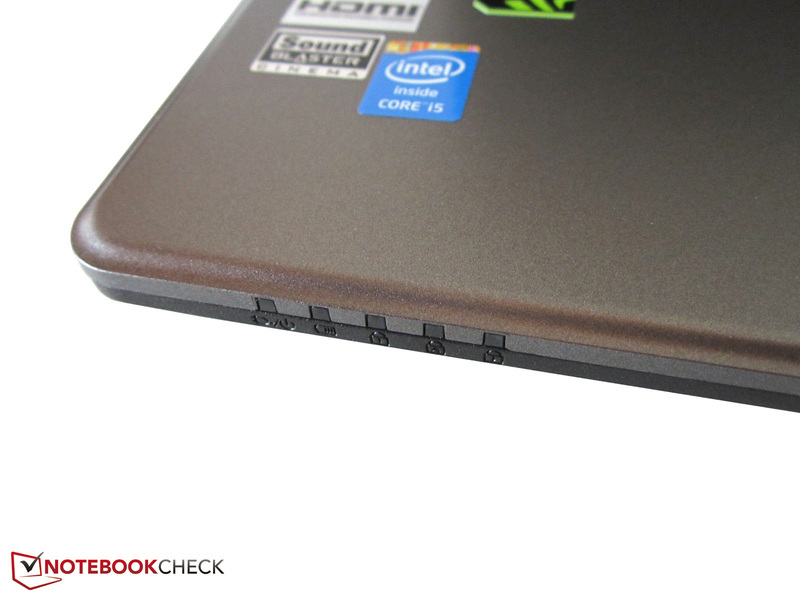 Despite the tight room, the XMG A504 features one mSATA slot and two 2.5-inch slots. Schenker makes use of this option, and offers a lot of HDDs, SSDs and hybrid models with up to 1000 or 1500 GB on its homepage. The choice of optical drives is not as sensational. DVD burners, Blu-ray combos and Blu-ray burners are standard nowadays. Beyond that, several wireless modules, keyboards, and operating systems are available. Only the graphics card is fixed: The GeForce GTX 860M is soldered to the motherboard and cannot be replaced. Our review configuration would currently add up to 1400 Euros (~$1925), as can be seen in the right column. Although the underlying W355SS barebone has a different name than its precursor (W355ST @ Schenker XMG A503), not many modifications have been made in a direct comparison. 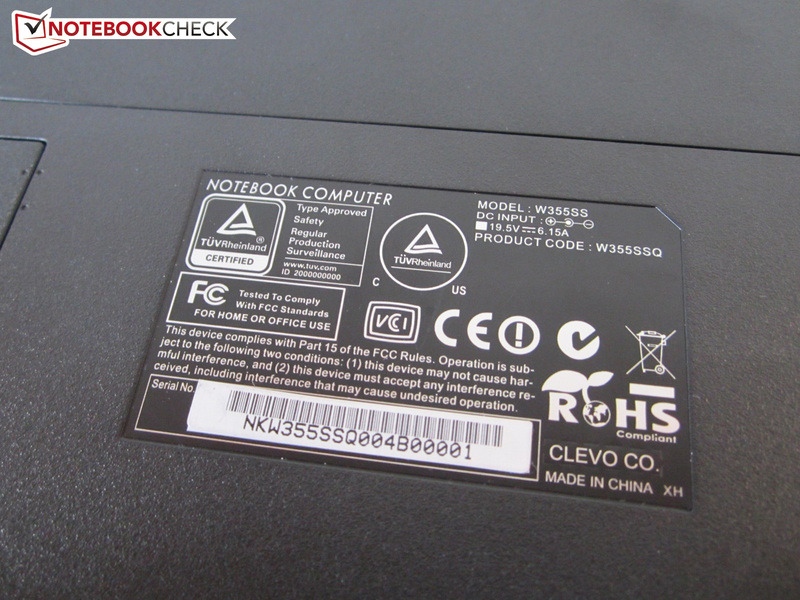 The casing manufacturer Clevo limits itself to details like changed status LEDs and a replaced special key (Control Center rather than VGA button). The biggest drawback in form of the high-gloss and extremely scratch and smudge sensitive display bezel is still used. We will not deal closer with the categories Case, Connectivity and Input Devices due to the few innovations here, and we will start directly with the display. The omitted details can be found in the review of the XMG A503. 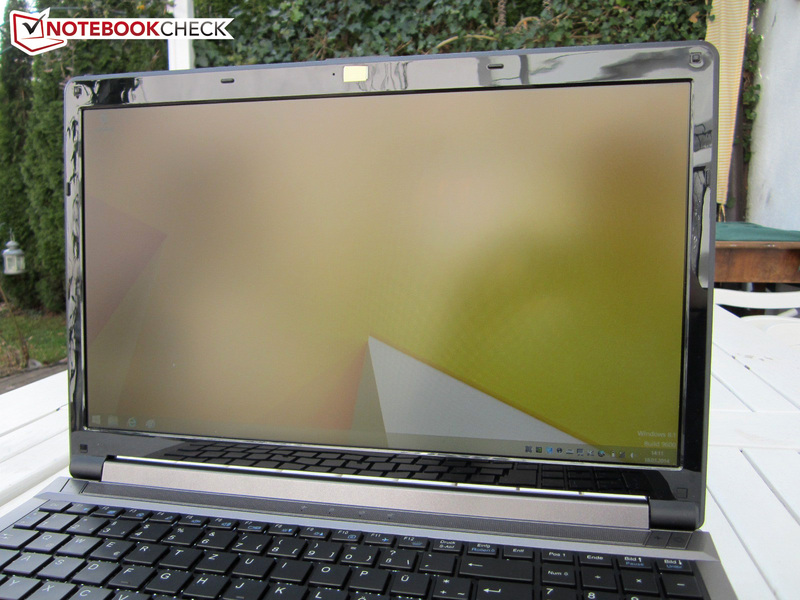 The matte, yet not absolutely ultra-matte, 15.6-inch screen also corresponds to the former generation. 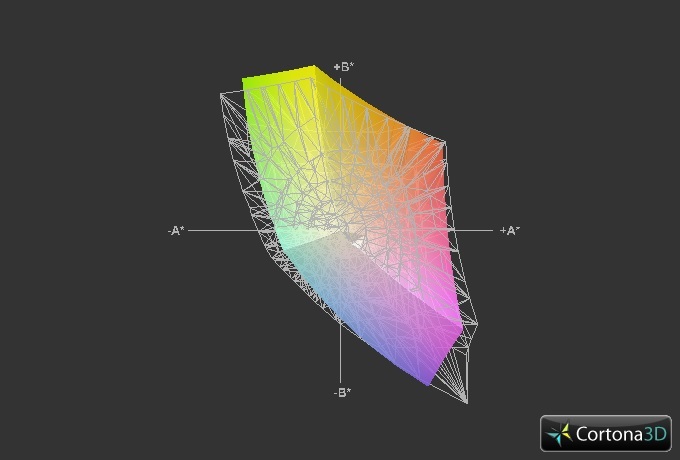 The highlight of the CMN N156HG screen is its enormous brightness. 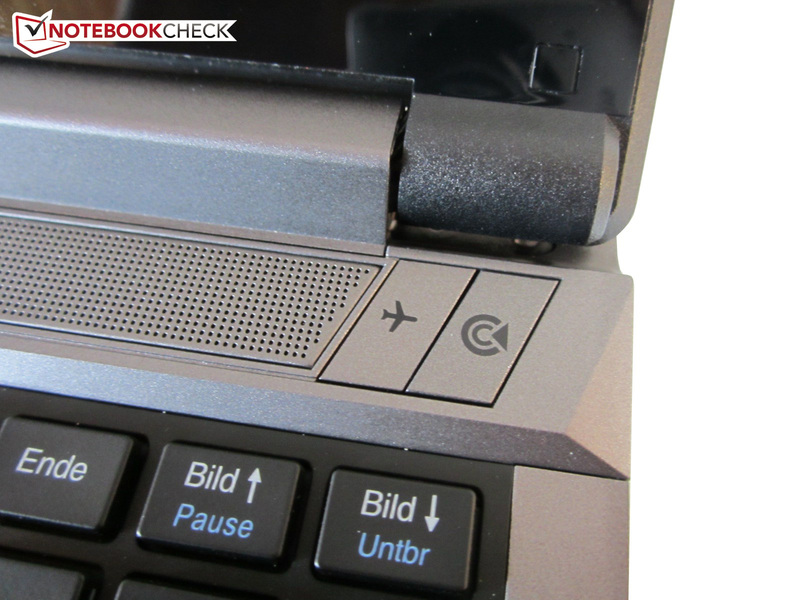 Most laptops do not reach an average brightness of 347 cd/m². The same is true for the contrast of almost 800:1. For example, the LG Philips LP156WF1-TLF3 in One's K56-4N (Clevo P150SM barebone) only achieves 600:1. 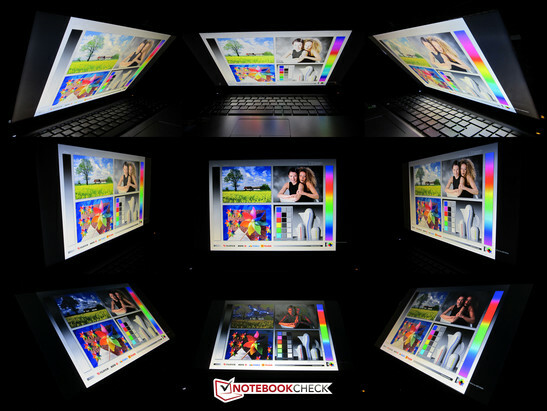 Although the 15-inch contender scores with a larger color space (84 vs. 73% sRGB) and a lower black level (0.38 vs. 0.45 cd/m²), the CMN N156HG fares better. 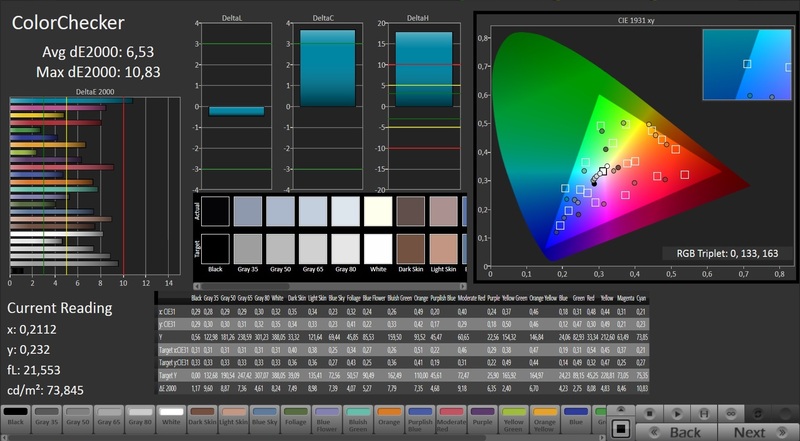 Besides the roughly two-thirds higher brightness, we would mention the tests performed using the professional CalMAN software. While the One K56-4N frequently surpasses the red mark (grayscale, color accuracy), the XMG A504 makes a considerably more balanced though not outstanding impression. 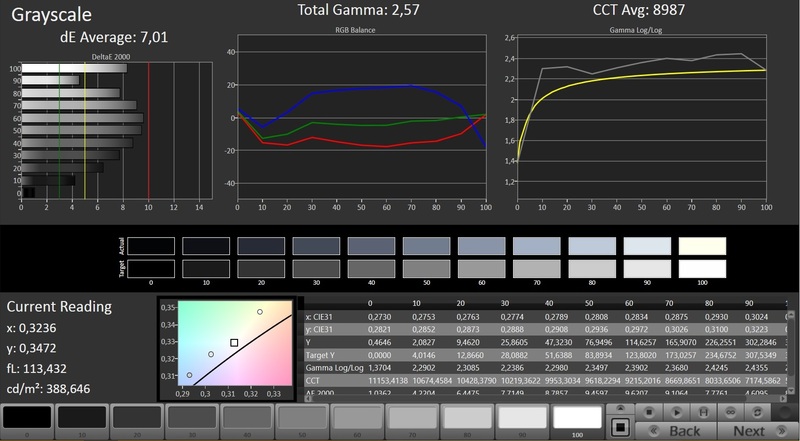 As to RGB balance and gamma, we also see advantages in favor of the CMN N156HG. The image subjectively looks rich and saturated in both models. 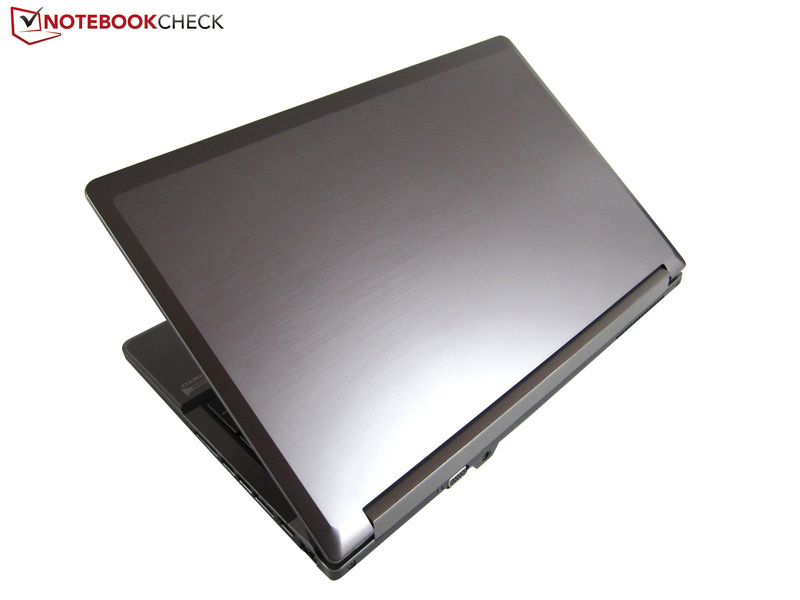 However, shifts toward blue are evident, as is common in the laptop sector. However, that will be uninteresting for gamers because videos and games are rendered decently. The fact that screen bleeding is seen on the screen's left and right edge disappointed us slightly, but they are only distracting in dark content. We also observed that the illumination shines through in slanted angles. The reason is smaller irregularities in build (transition: screen / display bezel). Talking about angles, as known from the TN technology, the viewing stability in the vertical field is rather second-rate. Even more slanted positions are possible horizontally, which contributes to "family suitability." The user benefits from the combination of a semi-matte finish and outstanding brightness in outdoor use. Using the laptop is absolutely possible as long as the XMG A504 is not placed in an extremely bright or unfavorable position (our screenshots show a negative example). 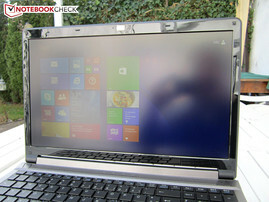 The image quality is overall good, although the screen clearly does not reach the level of an IPS. 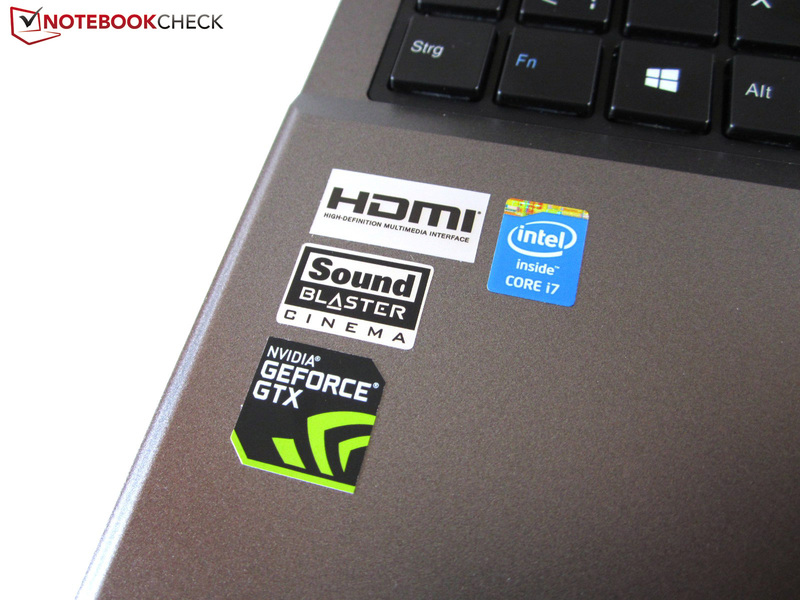 The Core i7-4700MQ installed in our review sample has developed to a kind of favorite in the high-end range. It flawlessly processes even demanding programs with 6 MB of L3 cache and a clock of 2.4 - 3.4 GHz. Hyper-Threading adds a virtual counterpart to every physical core so that the quad-core can simultaneously process up to eight threads (dual-cores: four maximum). Owing to the higher TDP that provides information about the waste heat, the 22 nm model is a bit less expensive than the Core i7-4702MQ, which is specified with 37 rather than 47 watts. 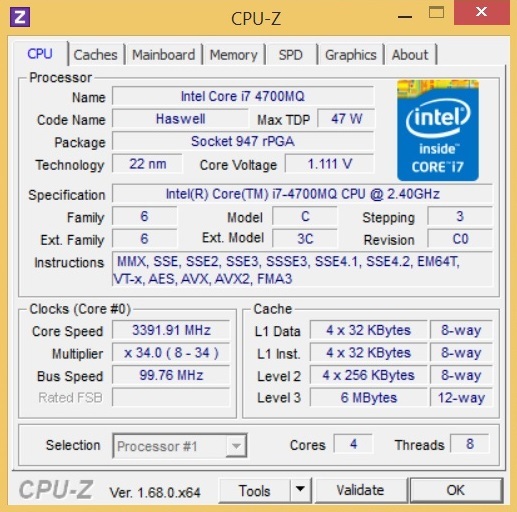 The premium i7-4910MQ model offered in the configurator is not really worthwhile despite its 8 MB L3 cache because the graphics card is more the limiting factor in games. 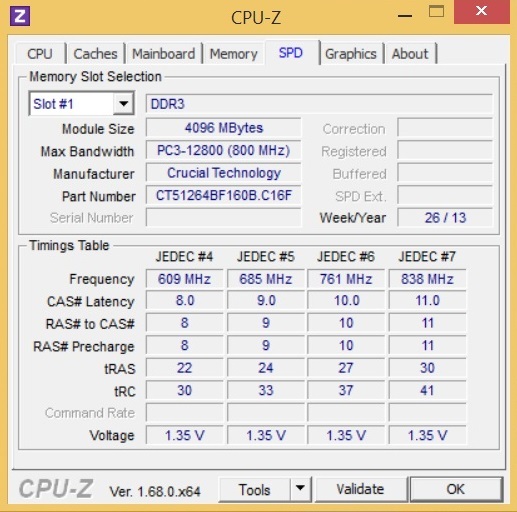 A dual-core would theoretically be enough for the laptop when excluding CPU-heavy games like Guild Wars 2. Tight budgets should preferably invest in an SSD. 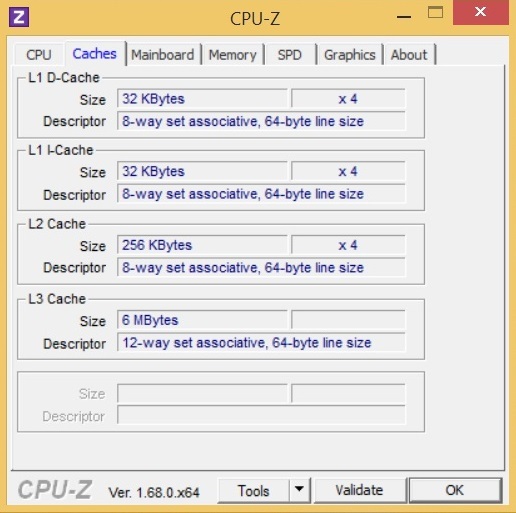 That has a bigger effect in Windows routine than a quad-core. 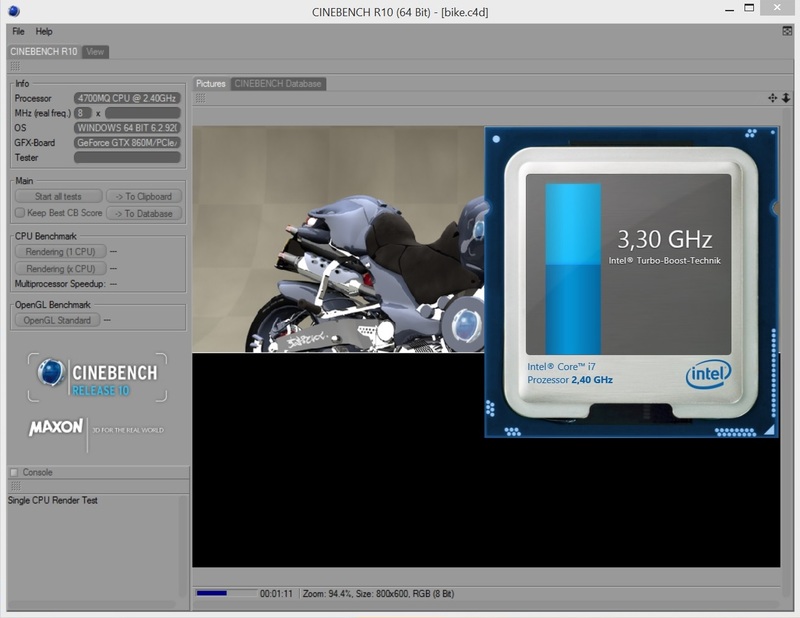 As seen in the test using Cinebench R10 and the Unigine Heaven benchmark, the CPU cannot completely max out its capabilities. Although approximately 3.1 - 3.4 GHz in single-core applications and 3.1 GHz in multi-core applications are relatively high, the clock temporarily drops to below 3.0 GHz, which is also expressed in some scores. Real throttling, i.e. a drop below the default rate, only occurred in the stress test via Furmark and Prime (~2.0 - 2.3 rather than 2.4 GHz). 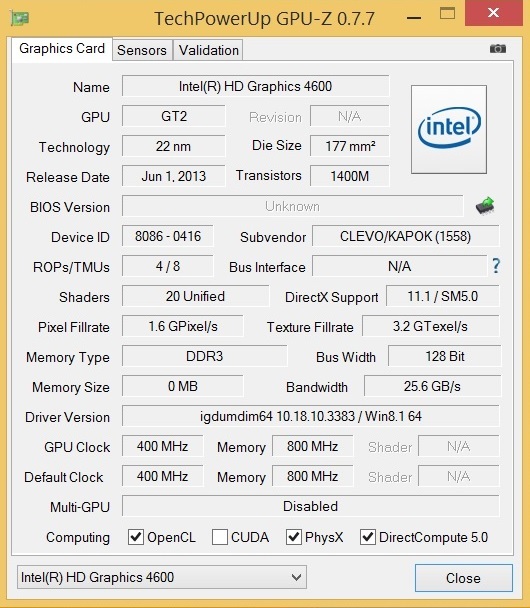 The graphics card also did not run with its default rate (~980 - 1080 rather than 1029 GHz). We believe that this minor deviation can be tolerated, especially since the stress test is quite unrealistic. 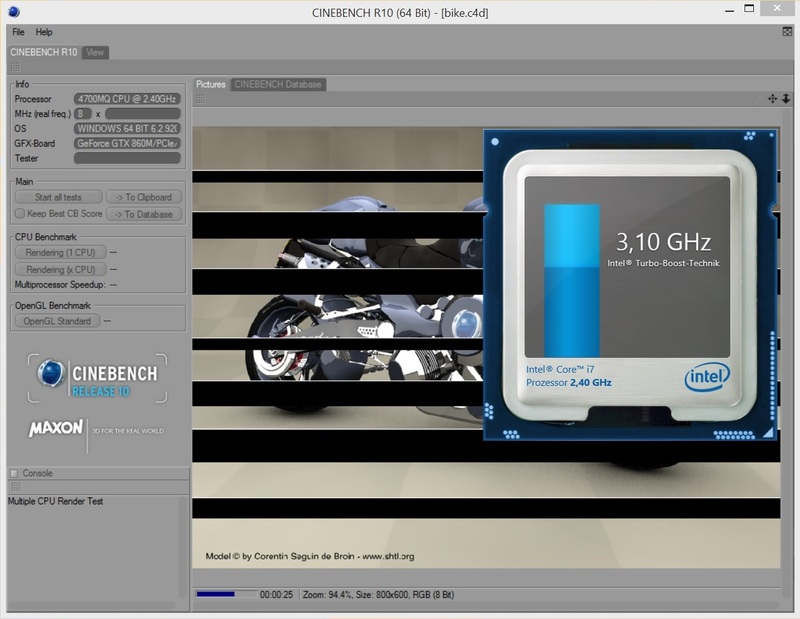 Schenker's XMG A504 complies with other devices featuring a Core i7-4700MQ or 4700HQ in the Cinebench R15 single-CPU benchmark. 131 points equals a plus of 11% on the Core i5-4200M (118 points @ Lenovo IdeaPad Z510), and a plus of 6% on the Core i7-4702MQ (124 points @ MSI GE40). 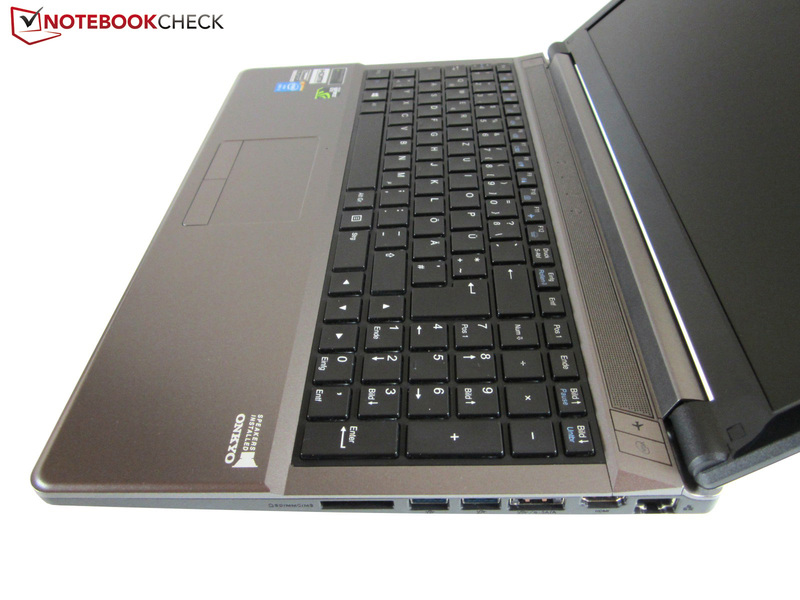 The brand new Core i7-4810MQ has a lead of 15% (151 points @ Schenker XMG P304). 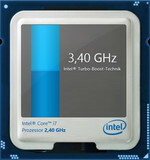 The distance between the dual and quad-core segment clearly increases in the multi-CPU test. 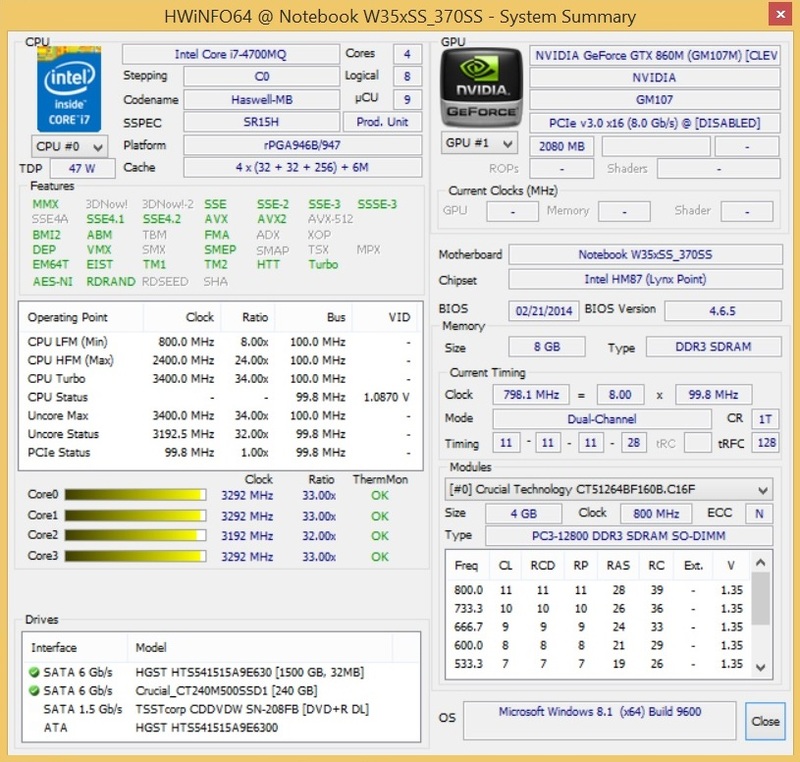 The Core i7-4700MQ roughly calculates twice as fast as the Core i5-4702MQ in HP's Envy 15-j011sg with 600 to 298 points. 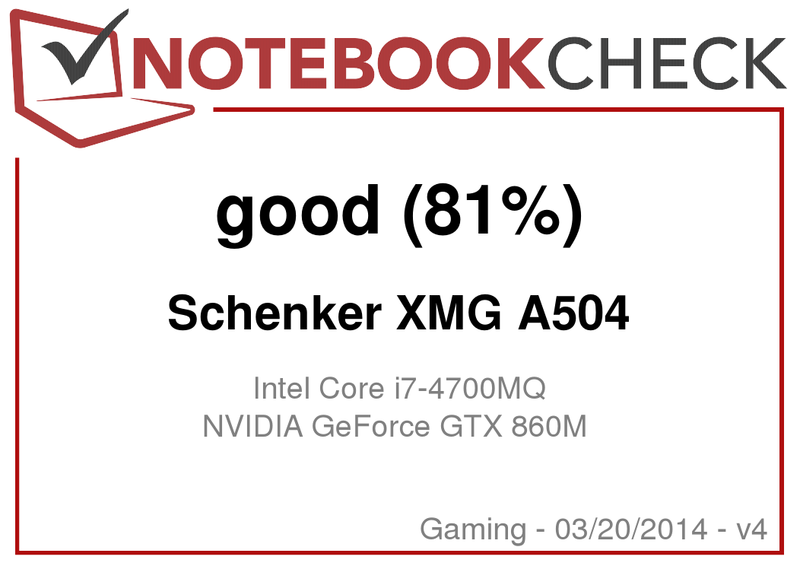 While the Core i7-4702MQ again slightly drops behind (575 points @ HP Envy 17-j110eg), the Core i7-4810MQ wins by almost 8% (647 points @ Schenker XMG P304). 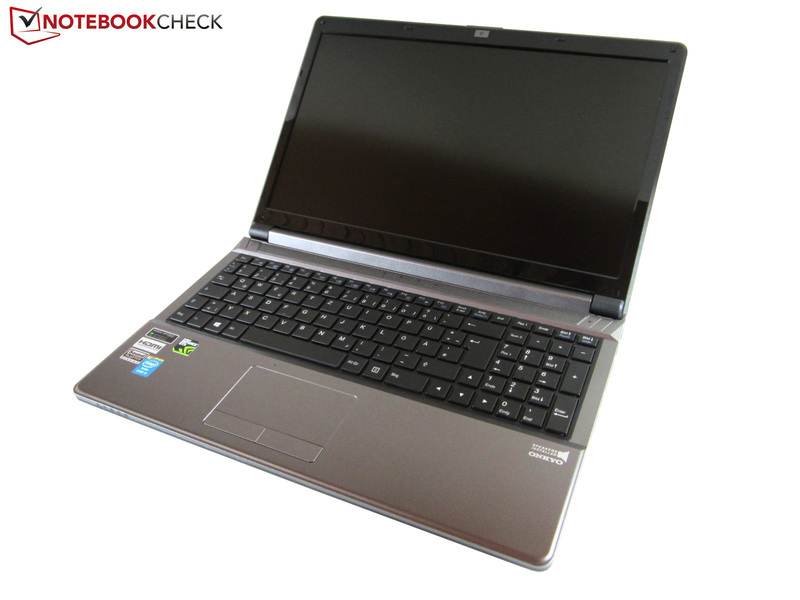 However, this level is also achieved by a few 4700 contenders (Schenker XMG C703, Gigabyte P34G, Lenovo IdeaPad Y510p, etc.). We already discovered that Nvidia has hit a home run with the GeForce GTX 860M in the XMG P304. The DirectX 11 capable, price-performance whopper comes from the brand new Maxwell generation that stands out with a high performance, and - compared with the former Kepler architecture - especially good energy efficiency. Although the 28 nm model "only" has 640 shader units (GTX 765M: 769, GTX 770M: 960), and a 128-bit memory interface (2048 MB GGDR5 VRAM), the GPU can throughout compete with premium contenders owing to the excellent clock rates of 1029 or 2500 MHz, and other improvements. To prevent excessive power consumption in basic tasks, such as office work or web browsing, the XMG A504 supports Nvidia's Optimus technology that automatically switches between the processor-integrated HD Graphics 4600 and the GeForce GTX 860M. 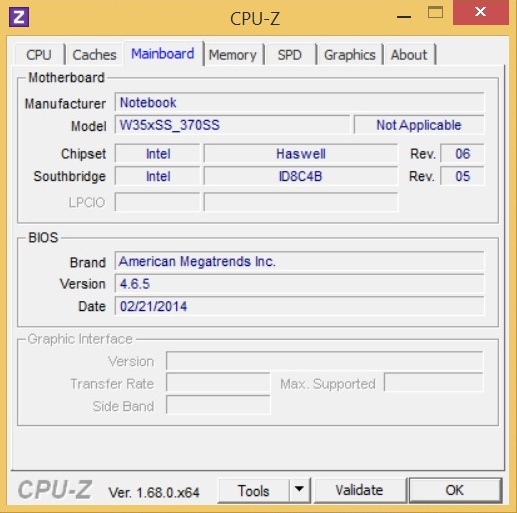 We used the pre-loaded driver version 332.60 for our benchmarks. As usual, Nvidia will likely extract even a bit more performance from the chip in the next few weeks/months. 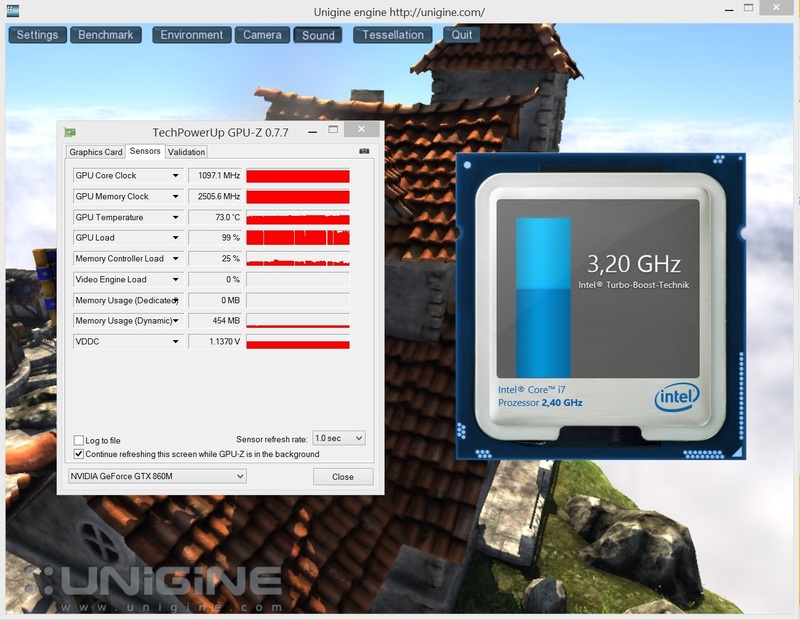 The GPU test results are very similar with those of the XMG P304. The 15-inch laptop achieves an average frame rate of 49.5 fps in the graphic-heavy Unigine Heaven 3.0 benchmark (1920x1080, high, default tessellation). This rate boosts the GTX 860M above the GTX 770 (47.5 fps @ Toshiba Qosmio X70) by almost 4%, and even 38% above the GTX 765M (36.0 fps @ Schenker W503). The Maxwell scion has a hard time competing against AMD's more power-hungry premium model. The Radeon R9 M290X in One's K56-4N accomplished exactly 62.0 fps (+25%). 3DMark 13's Fire Strike test confirms this ranking. With a GPU score of 3936 points, the GTX 860M is 10% faster than the GTX 770M (3569 points @ Gigabyte P25W), but it is nevertheless 26% slower than the R9 M290X (5294 points @ One K56-4N). 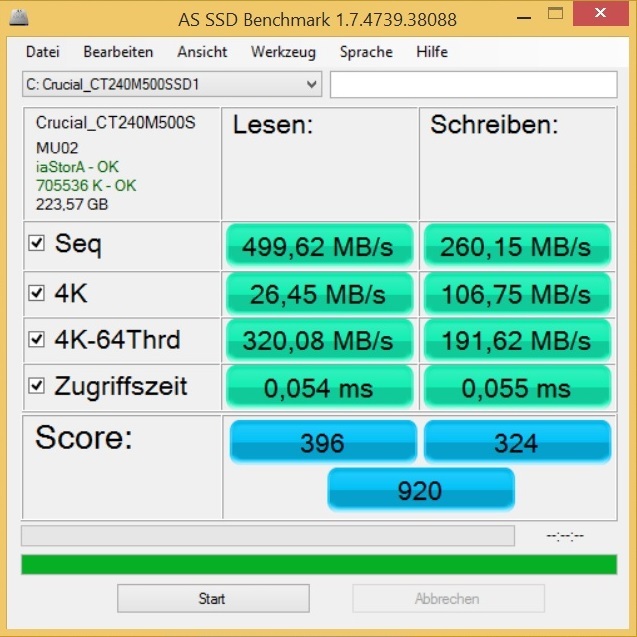 The old Nvidia GTX 765M model is faced with a bitter defeat: It lags a whole 30% behind the GTX 860M (2768 points @ Schenker XMG A503). 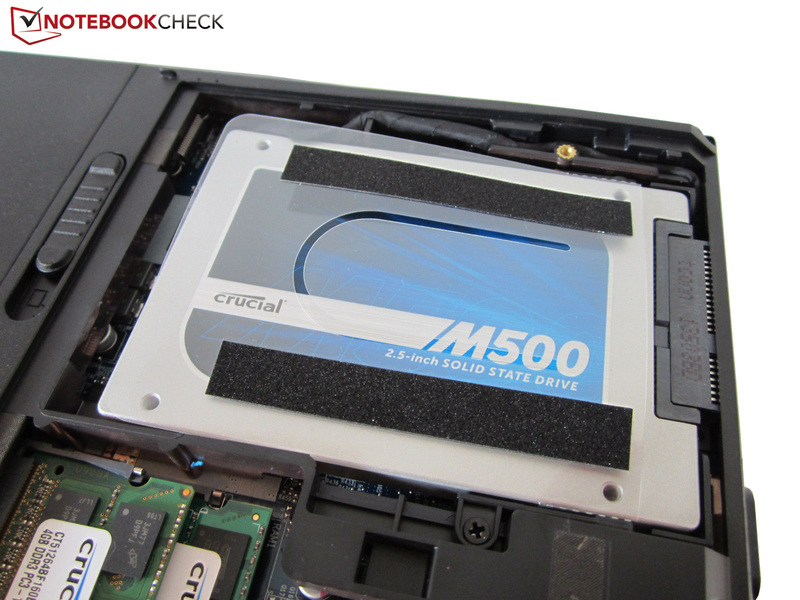 Bargain hunters who want to purchase a 2.5-inch SSD will find one in Micron's Crucial M500. 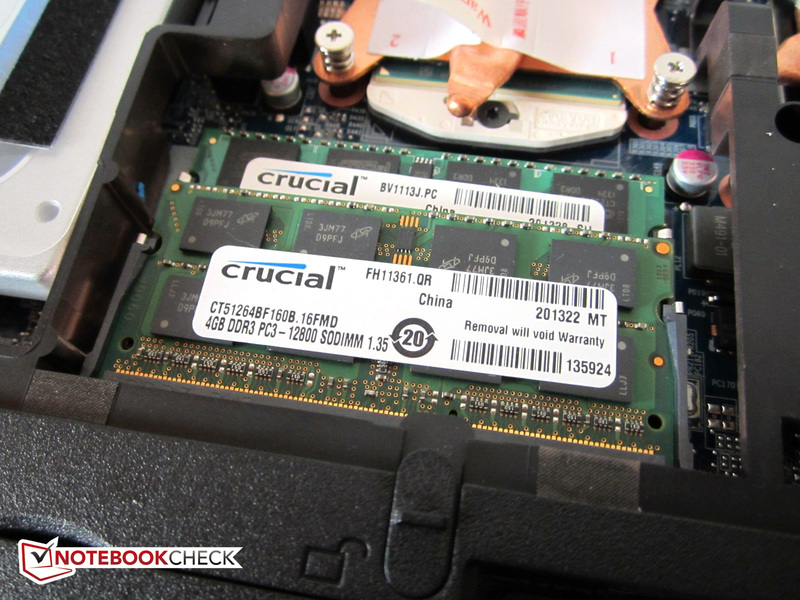 The 240 GB version that we tested definitely left a solid impression. 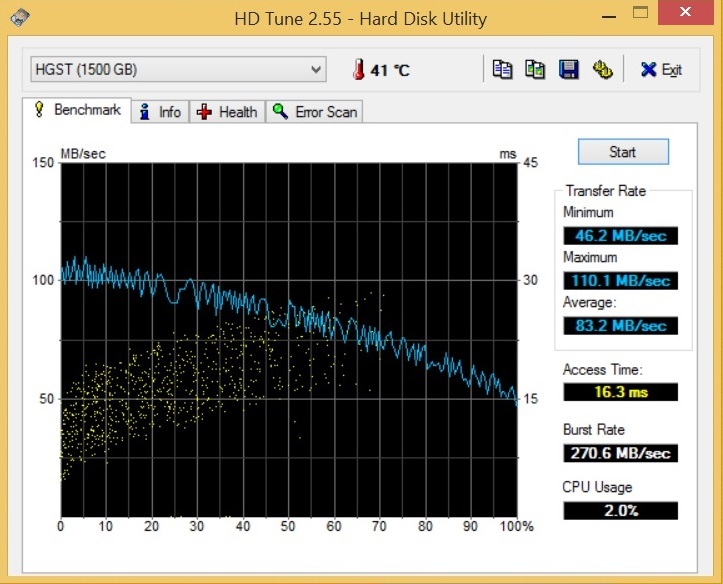 Approximately 500 MB/s in sequential read and 260 MB/s in sequential write remain out of reach for conventional HDDs. 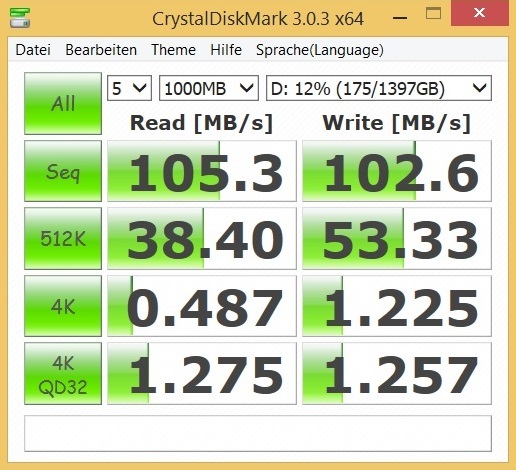 We should mention that some SATA III SSDs deliver higher rates. For example, the 250 GB version of Samsung's 840 EVO that manages up to 462 MB/s, which is a good 80% more. The 840 EVO also tends to achieve a better score with smaller files. The access times of both solid state drives are good. AS SSD recorded below 0.06 ms in both cases. Users will have to decide for themselves whether the extra costs for an 840 EVO or another flash product is worthwhile. The system's speed more than justifies the purchase price. 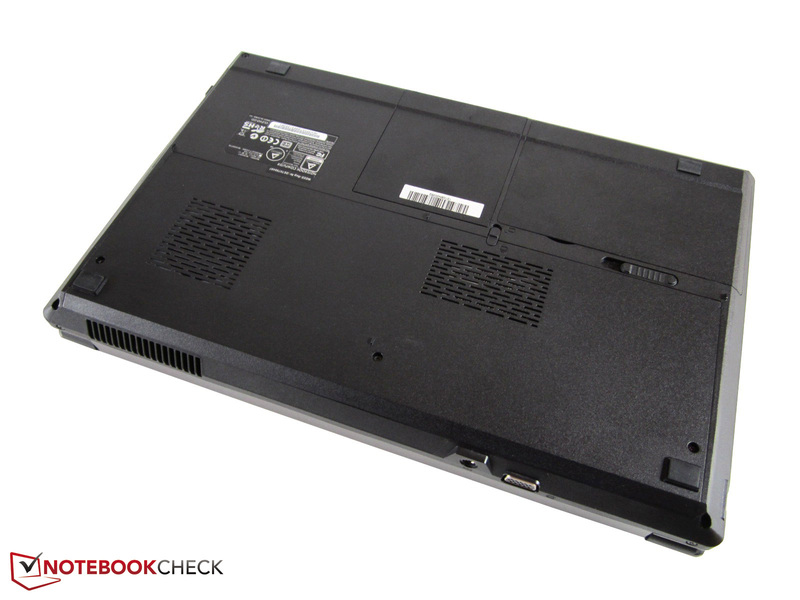 The 5780 points that the 15-inch laptop scored in PCMark 7 deserves great respect. Besides the dual-core laptops Alienware 18 (4930MX, GTX 780 SLI, 512 GB SSD) and Aorus X7 (4700HQ, GTX 765M SLI, SSD RAID), the One K33-3E (4702MQ, GTX 765M, 128 GB SSD) and the Bullman C-Klasse 5 (4900MQ, GTX 765M, 240 GB SSD) also performed on this level. 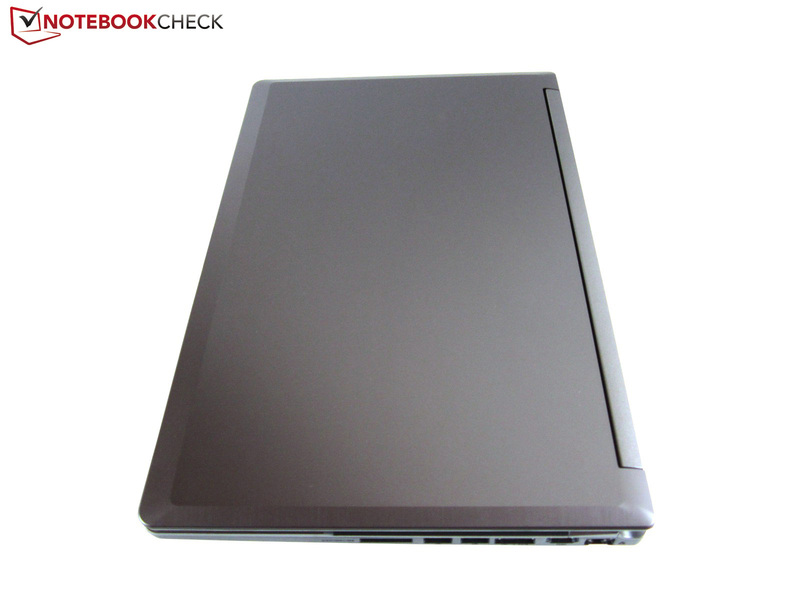 The combination of a quad-core processor and solid state drive generally ensures high future security. New games are rendered smoothly in the native 1920x1080 pixels when maximum settings and multiple anti-aliasing are not used if necessary. Even Battlefield 4, that has a high requirement on the graphics card, ran with almost 30 fps in the ultra setting. Based on the eight tested titles, we can confirm that the GTX 860M has a high performance that is roughly on par with the GTX 770M, with exception of the driver-dependent Titanfall. The actual GTX 765M precursor is defeated by about 25%. 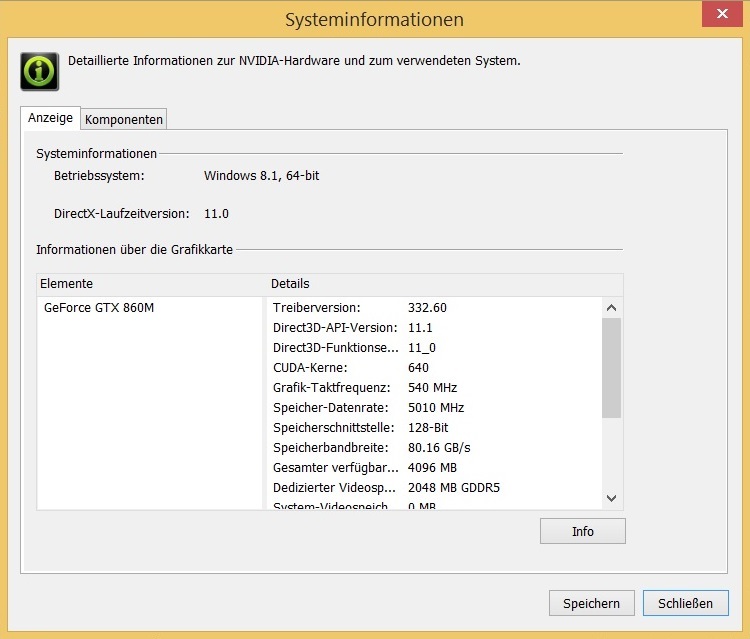 The DirectX 11 chip is no threat for the (former) premium models GTX 780M and R9 M290X. While the first has a lead of almost 30%, the latter calculates 40% faster. The fan management of the W355SS is noticeably better than that of other Clevo barebones. 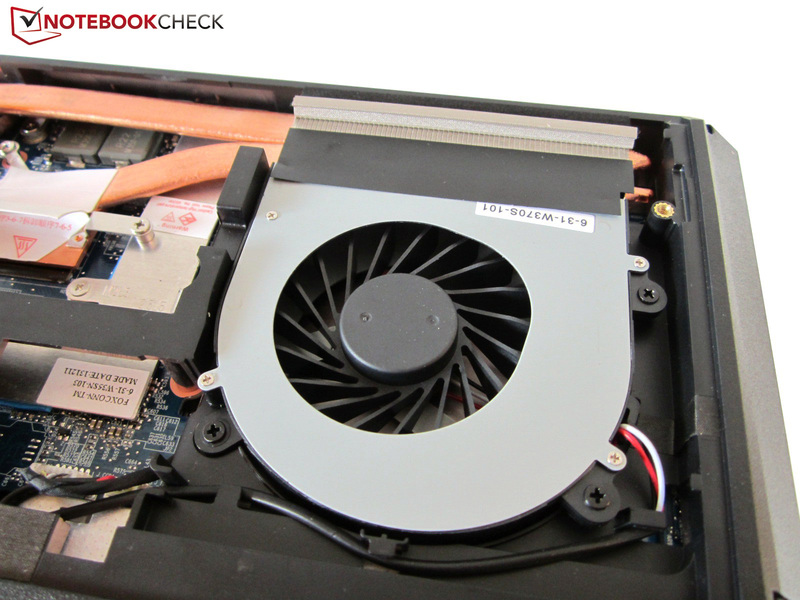 The fan often spins so quietly in idle mode that the user is only faced with the restrained noise from the hard drive (~31 dB). The XMG A504 would be even a bit quieter without an HDD. 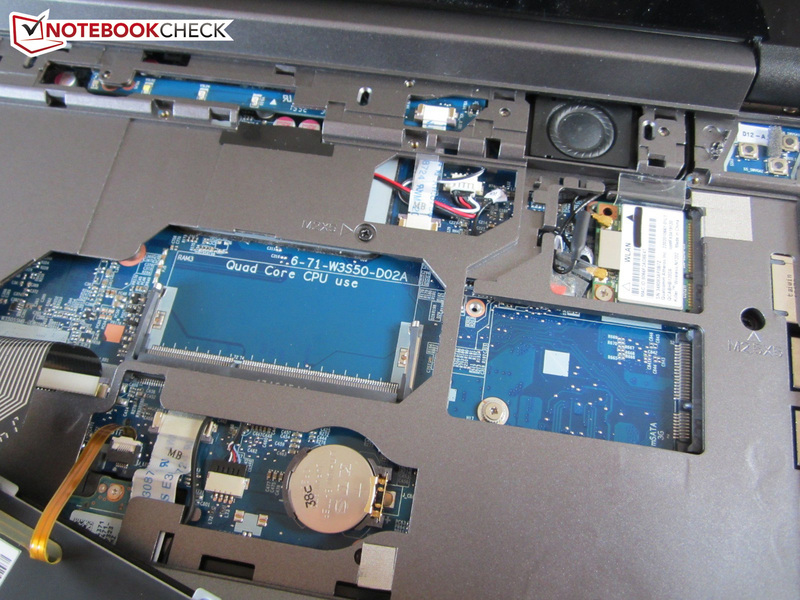 The laptop is generally barely audible after a longer idle period because certain components are asleep. It is still absolutely tolerable 33 dB(A) when the fan's speed does increase. 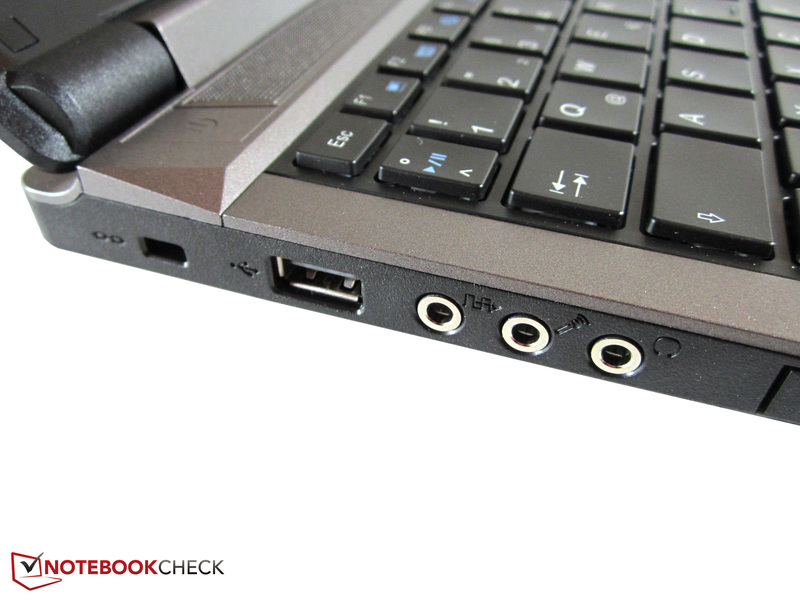 That is no comparison with the P150SM or P370SM barebone, which are already clearly audible when idling. 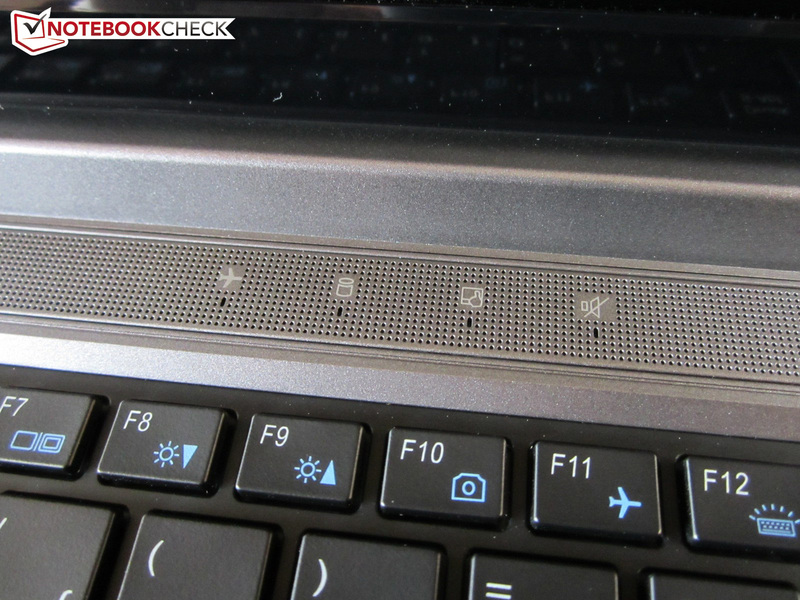 The fan's speed increases considerably during load. Almost 44 dB(A) might be normal for high-end laptops in the first scenario of 3DMark06, but noise-sensitive users will nevertheless want a lower level. 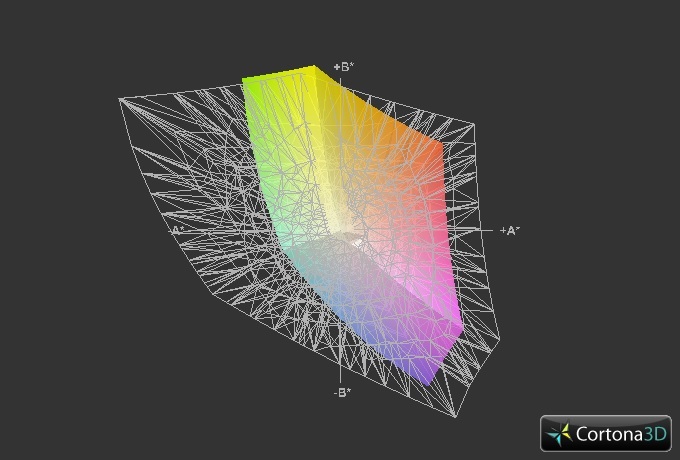 The fan noise is still acceptable as long as 3D applications are accompanied by background noises (music, game sounds, etc.). The maximum level of 50 dB(A) specified below is only achieved during full load, which is rather unlikely, even in graphic-whoppers like Crysis 3. The temperatures do not give much reason for complaint. Although the chassis heats up to 47 °C (upper side) and 46 °C (underside) in 3D operation, the wrist rest remains surprisingly cool. A maximum of 30 °C does not get uncomfortable even during a longer gaming session. Schenker's 13-inch XMG P304 model reaches considerably higher temperatures. The entire chassis has a pleasant temperature in ideal situations, so during low or no load. An average of 32 °C results in a good total score. It can only get unhealthy inside. 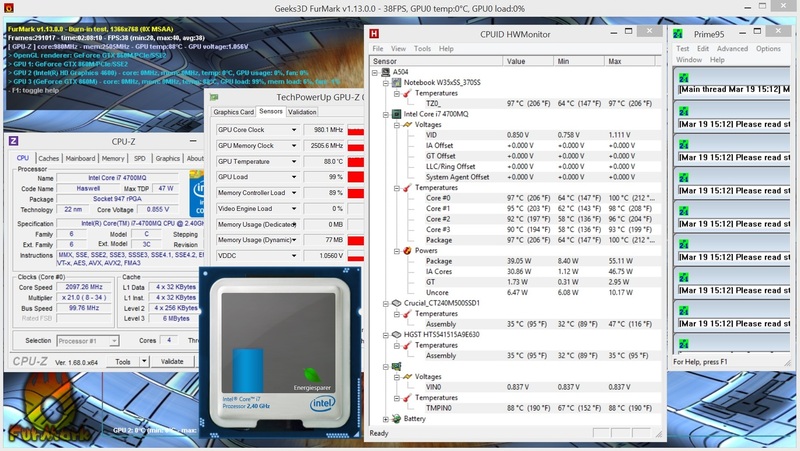 Our stress test caused a maximum GPU temperature of 88 °C, and a maximum CPU temperature of 100 °C according to the HWMonitor tool. 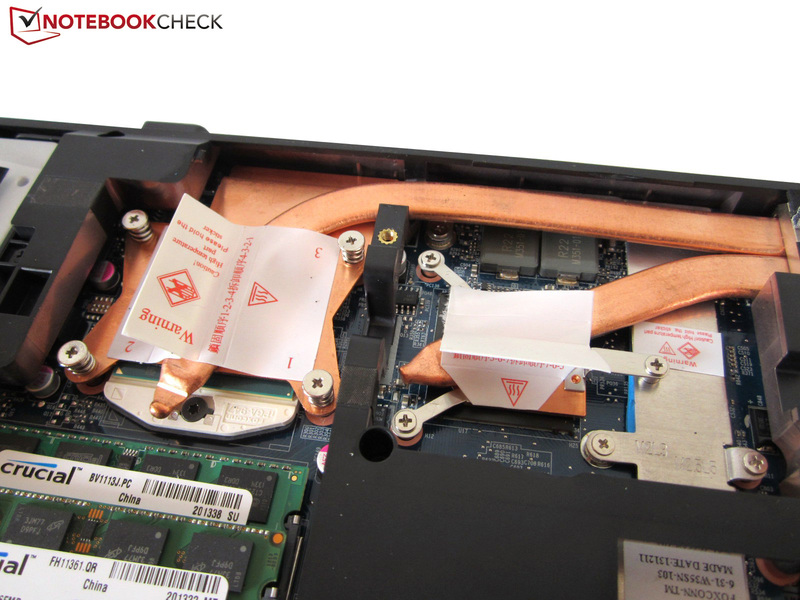 The single-fan design with only one heat pipe for both the graphics card and processor is pushed to its limits here. (-) The maximum temperature on the upper side is 47.2 °C / 117 F, compared to the average of 39.3 °C / 103 F, ranging from 21.6 to 68.8 °C for the class Gaming. (+) In idle usage, the average temperature for the upper side is 31.2 °C / 88 F, compared to the device average of 32.9 °C / 91 F.
Since the 2.0 system has apparently not undergone any modifications, we would refer to the XMG A503 here. 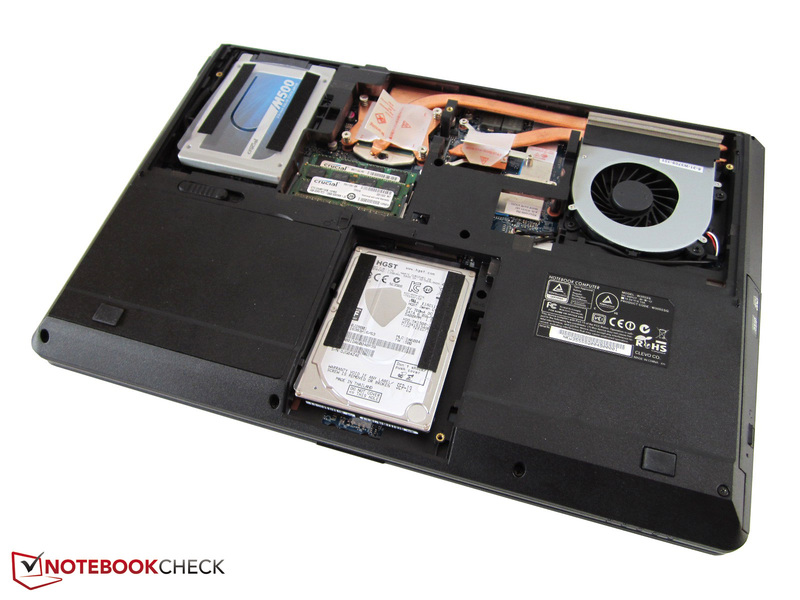 Despite the massive performance boost, the W355SS barebone does not consume much more power than the W355ST. It does not really matter if it is 16 - 26 or 15 - 25 watts in idle on the electricity bill. Unfortunately, the graphics card's energy management cannot be compared directly due to the different CPU (4700MQ vs. 4300M), although there are some indications that the GTX 860M undercuts the level of the GTX 765M. The rates in 3DMark06 are very similar though. The XMG A503 test configuration consumed around 88 watts, and we ascertained an average of 91 watts in the successor. The power consumption first really increases in full load: Up to 150 watts is somewhat steep for a 120 watt power supply, depending on the energy conversion efficiency. 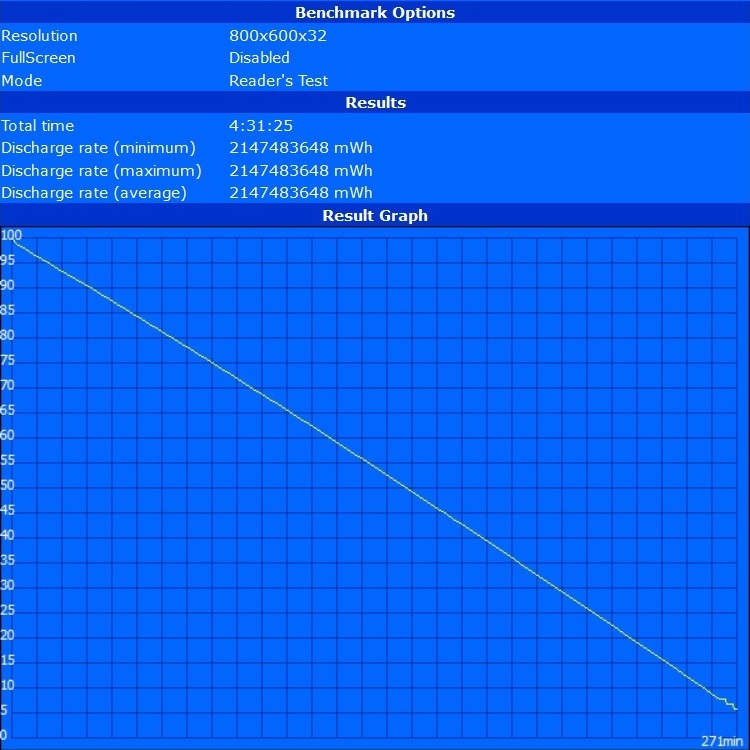 Gaming laptops with a long battery runtime were rare a few years ago. 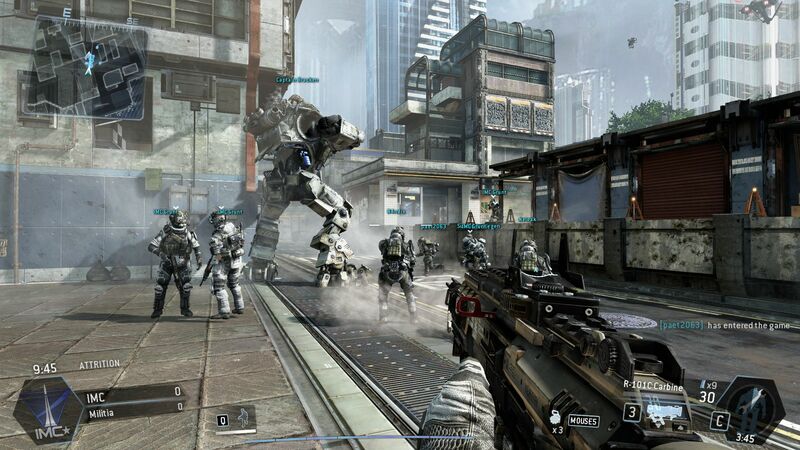 However, now good results are possible owing to new technologies like Nvidia's Optimus graphics switching. Schenker's XMG A504 also proves this. 3.5 hours of wireless Internet browsing in medium brightness seem just as feasible as two hours of 3D operation using maximum brightness to us. Up to 4.5 hours of idling are even possible with the 8-cell battery (77 Wh, 5200 mAh) when using minimum brightness. 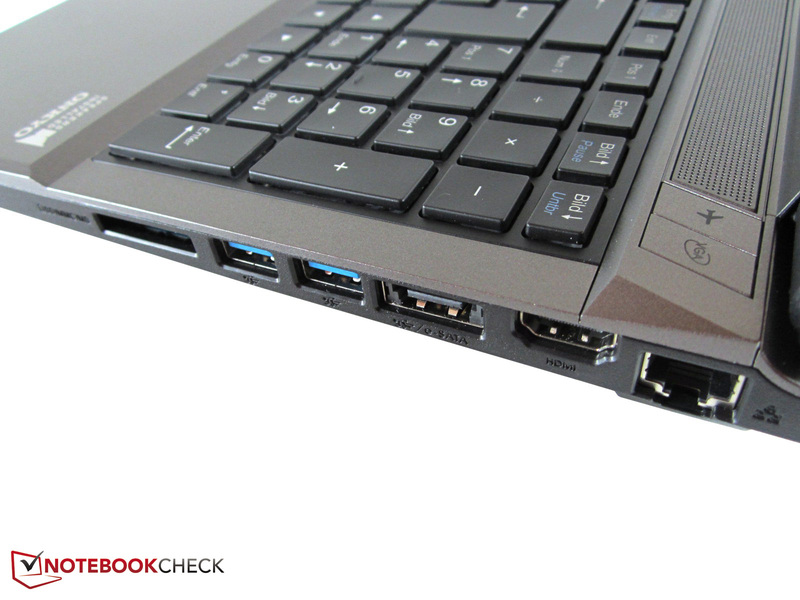 Users who want even more mobility in the 15-inch category should take Gigabyte's P25W (max. 9 hours). Buyers should be aware of four things before buying the XMG A504: 1. The display bezel will have scratches after only a few weeks; 2. The fan is not exactly quiet in gaming operation; 3. The atmosphere of entertainment media will be lessened without headphones or external speakers; 4. The plain-looking plastic casing has a few production flaws in some places. Still interested? Good, because the notebook does not give much reason for complaint apart from these shortcomings. Besides other things, we have the very bright screen that scores with a high contrast and a relatively matte surface on the positive side. The interface distribution also seems well-considered and allows unimpaired mouse usage. Some companies could also take an example on the great maintenance options, the freely configurable hardware, and the clean Windows installation. Not to mention the moderate temperature development (chassis) and a chiclet keyboard with a white backlight. 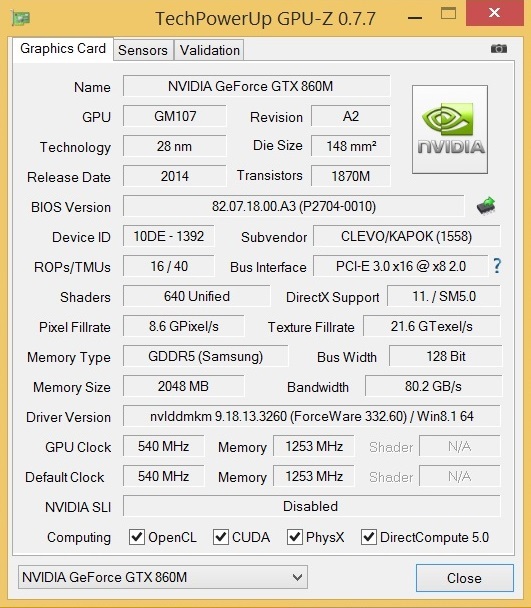 Gamers will be particularly delighted about the GeForce GTX 860M. Nvidia manages a virtually perfect compromise of performance, waste heat, and power consumption in its Maxwell version (but we will have to wait and see how the Kepler counterpart will fare). 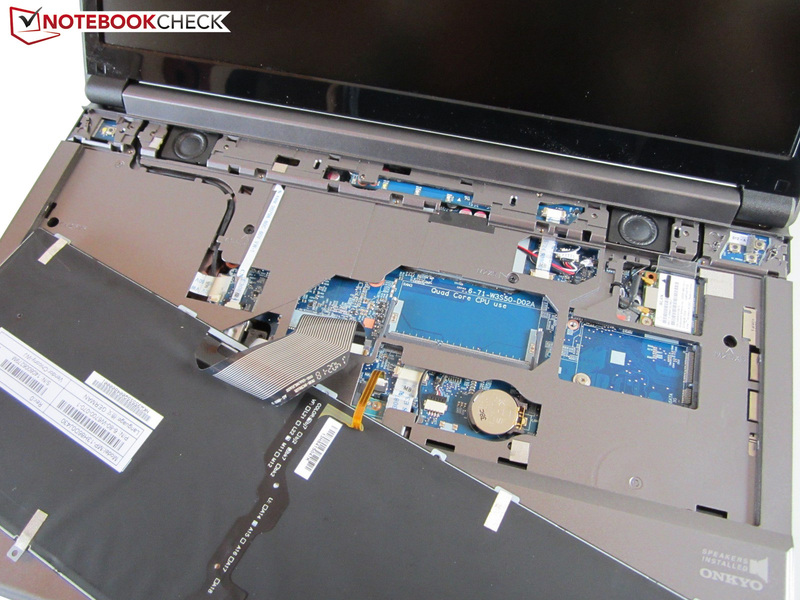 We overall tend to put our thumbs up for the laptop. In Review: Schenker XMG A504. 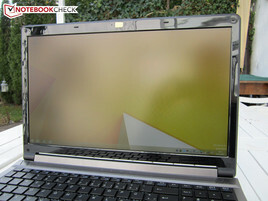 Review sample courtesy of Schenker Technologies. 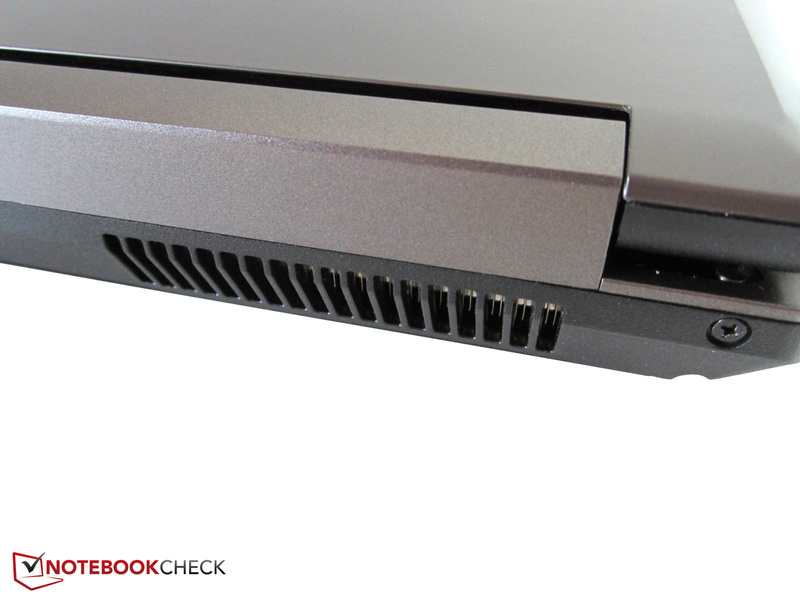 The W355SS barebone is virtually the precursor's identical twin. Thus, the majority of pictures come from the XMG A503. The base looks very clearly arranged. We should not expect an ultra-slim gaming machine. Buyers will not get high-quality aluminum either. 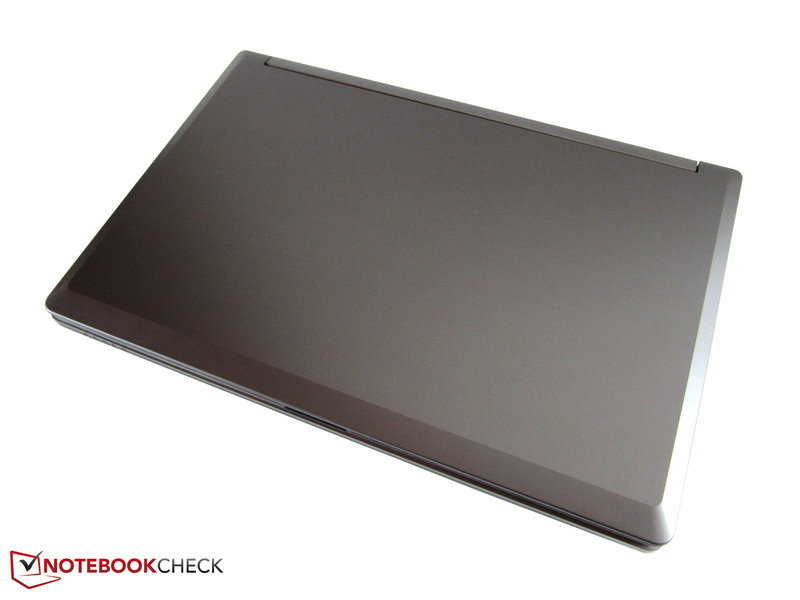 The 15-inch device is made of silver-gray plastic. Black components add some relief. 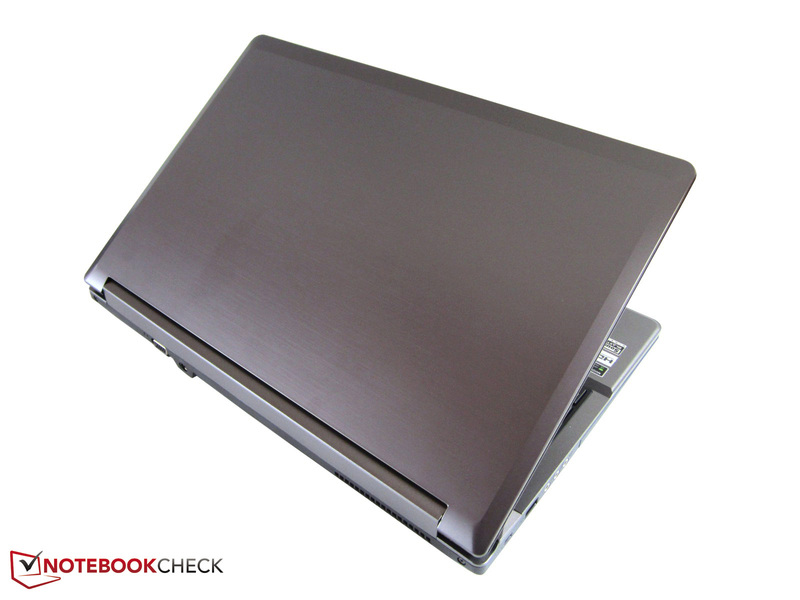 Clevo barebones are recognized by their outstanding maintenance options. Build and material quality are decent. The design is more plain than modern. Praise is due for the well-considered interface placement. The covers on the base can be removed with a normal screwdriver. Accessing the cooling system is done in a flash. 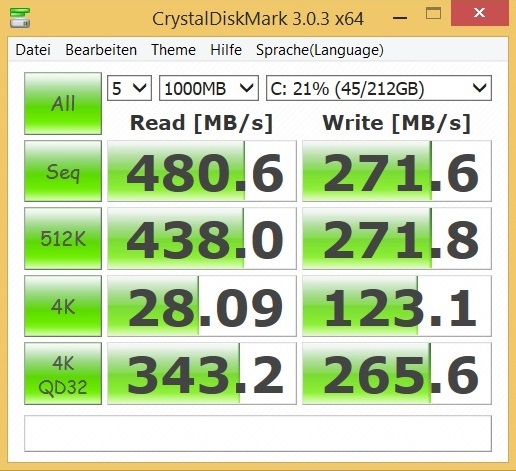 Windows seems slower without an SSD. The fan increases its speed considerably during load. The graphics card (right) is much smaller than the processor (left). 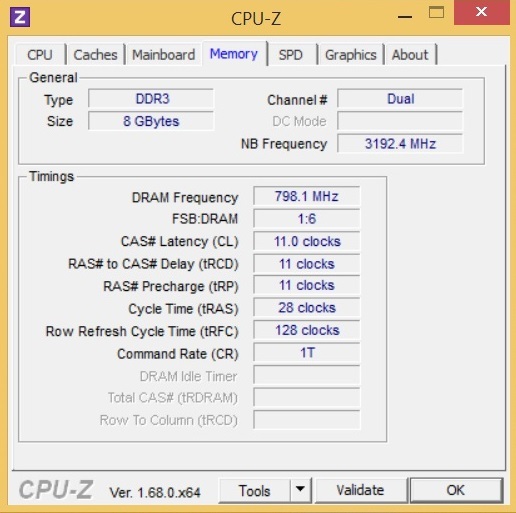 8 GB of DDR3 RAM is easily enough for now. Two 2.5-inch storage devices can be installed. 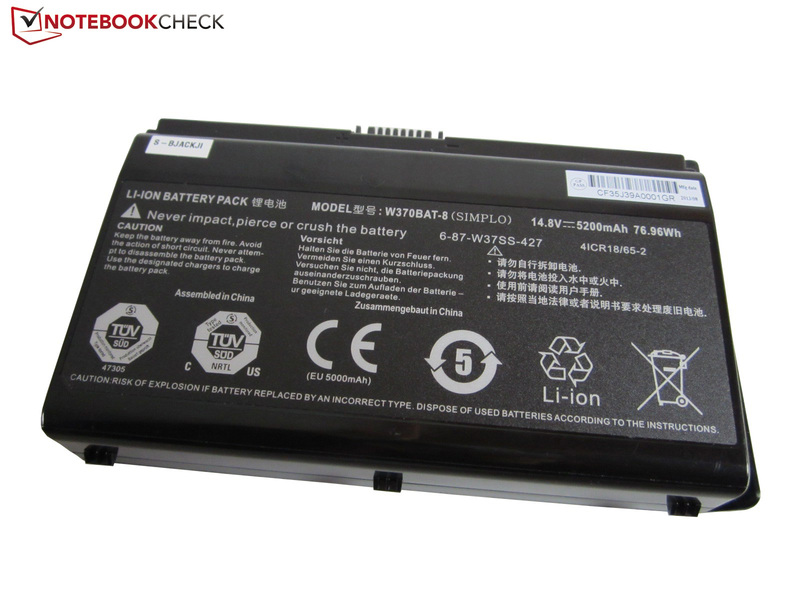 77 Wh is above average for a laptop battery. A 2 megapixel webcam is installed. 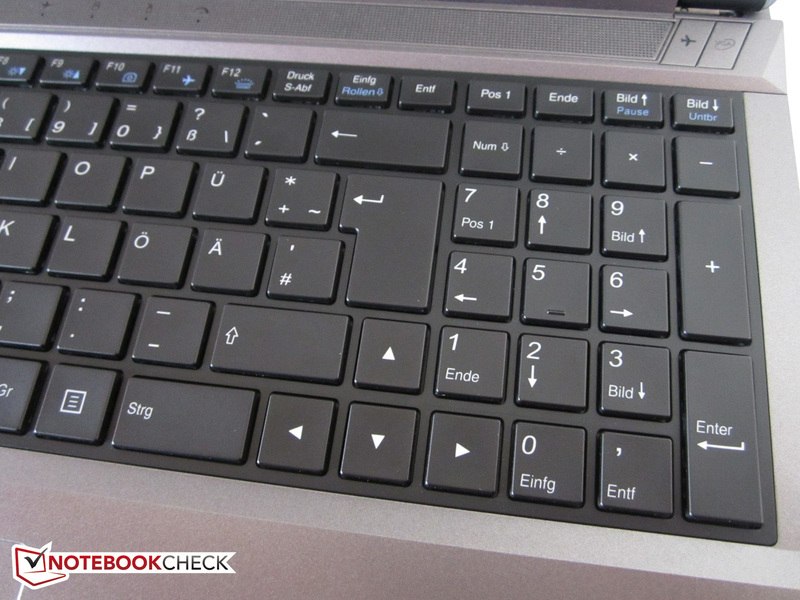 The status LEDs above the keyboard have been adapted. 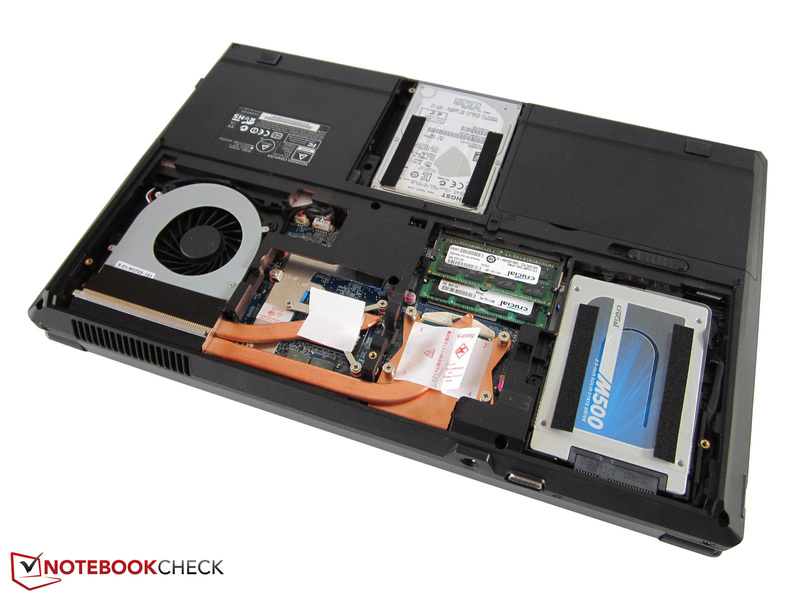 There are otherwise barely any modifications compared with the W355ST barebone. 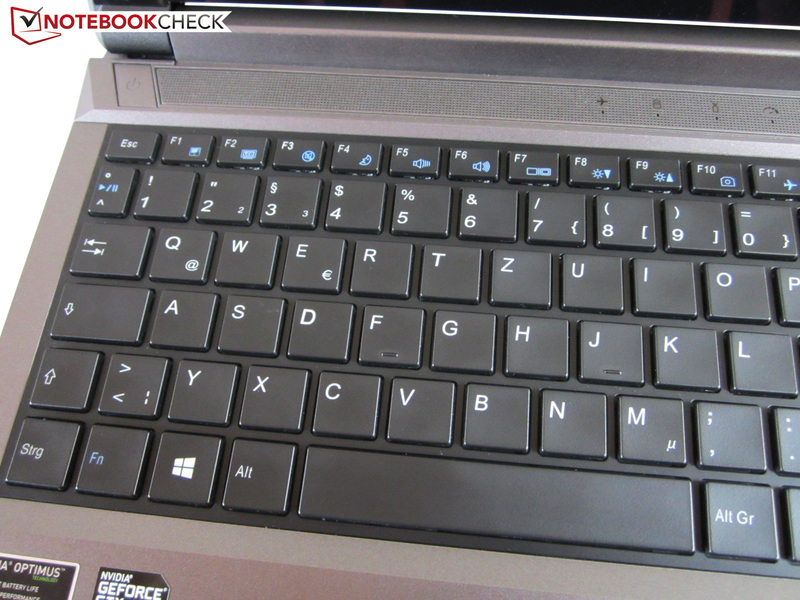 The keyboard can be removed if necessary (screws). 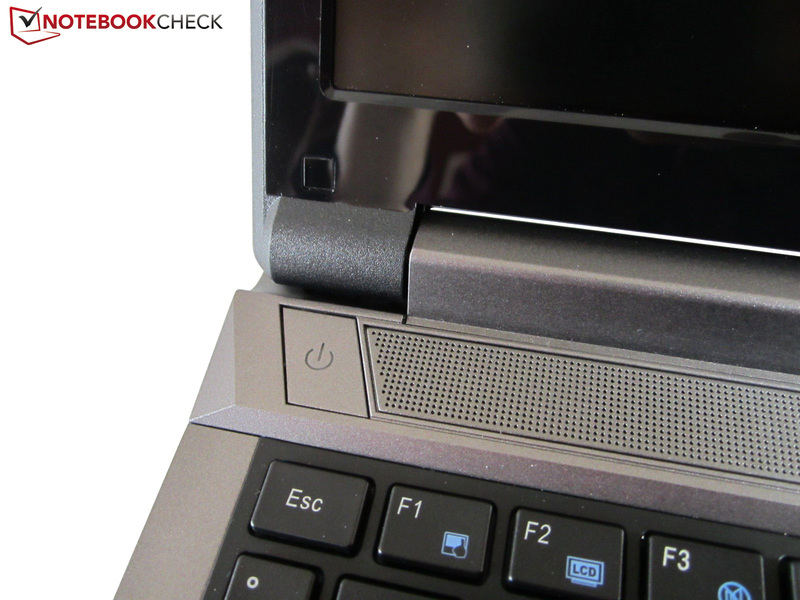 An mSATA slot and the third RAM bank are located under the keyboard. Schenker does not build the casing itself. The squarish keys have a pleasant surface. Layout and size are beyond reproach. 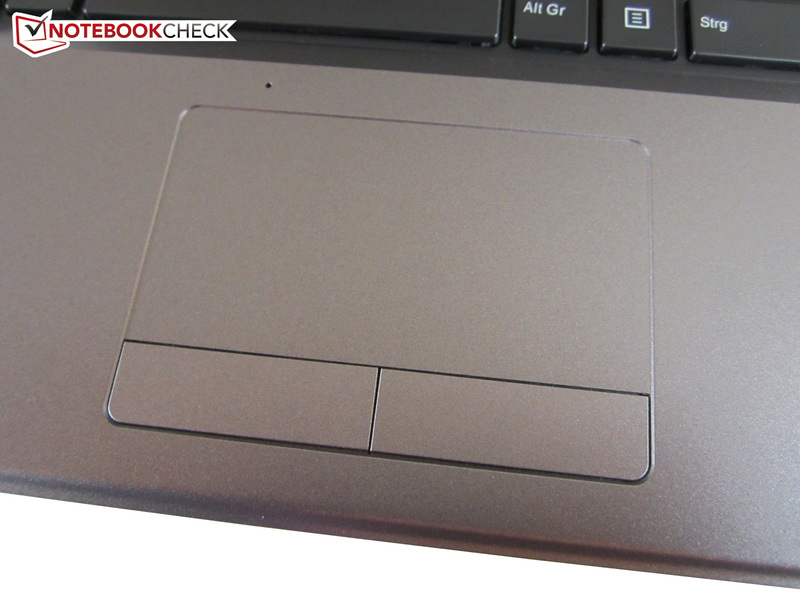 However, the touchpad has room for improvement. The right additional button opens the Control Center. 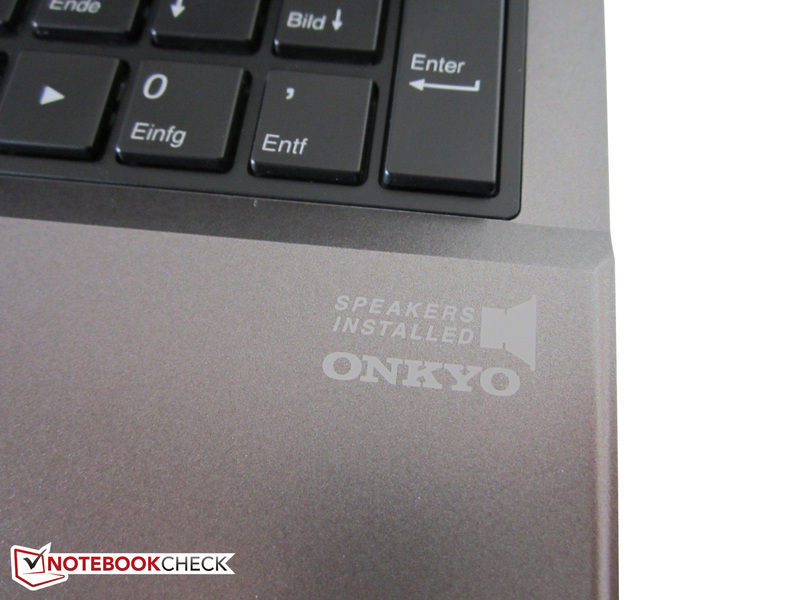 The sound quality is modest despite Onkyo speakers. 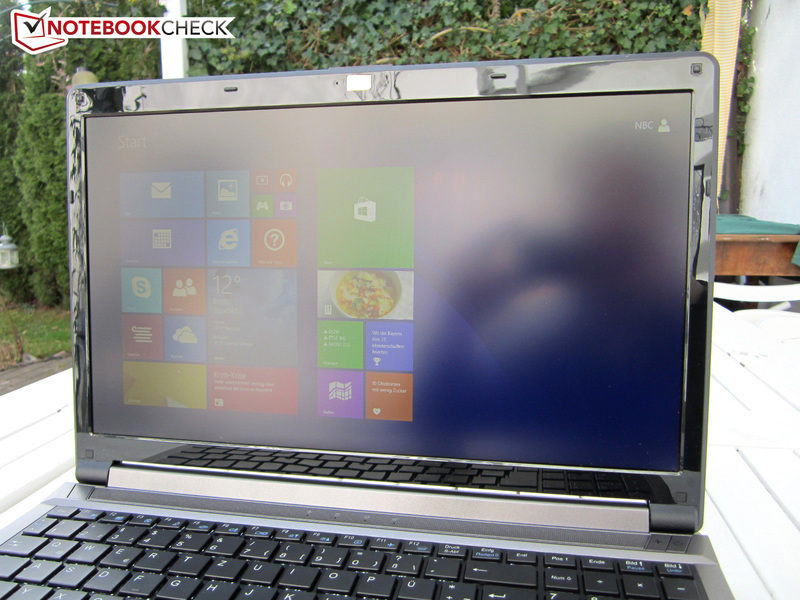 The display's glossy bezel smudges extremely. The GeForce GTX 860M is based on the brand new Maxwell architecture. Some status LEDs have been placed on the front. 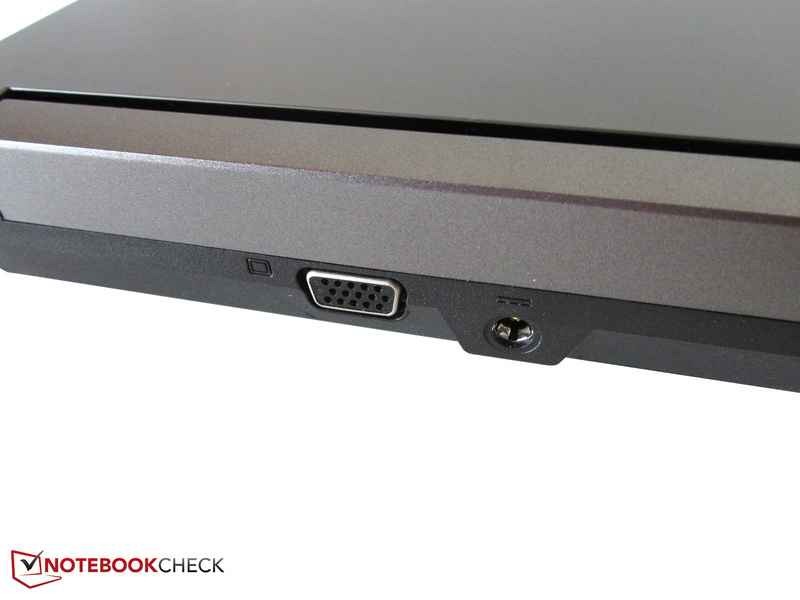 The eSATA port is a USB 3.0 combo. Only the power socket and a VGA port for analog monitors are on the back. Mouse users will not be bothered by the fan's waste heat. The XMG A504 supports S/PDIF. 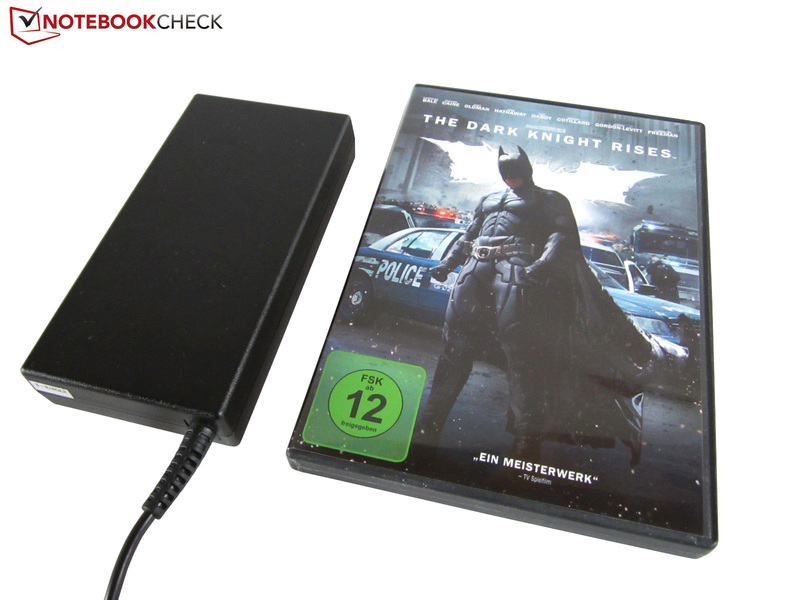 The power supply is not small, but is surprisingly slim. Despite its small size, the GeForce GTX 860M is extremely powerful. A better sound system would be nice. 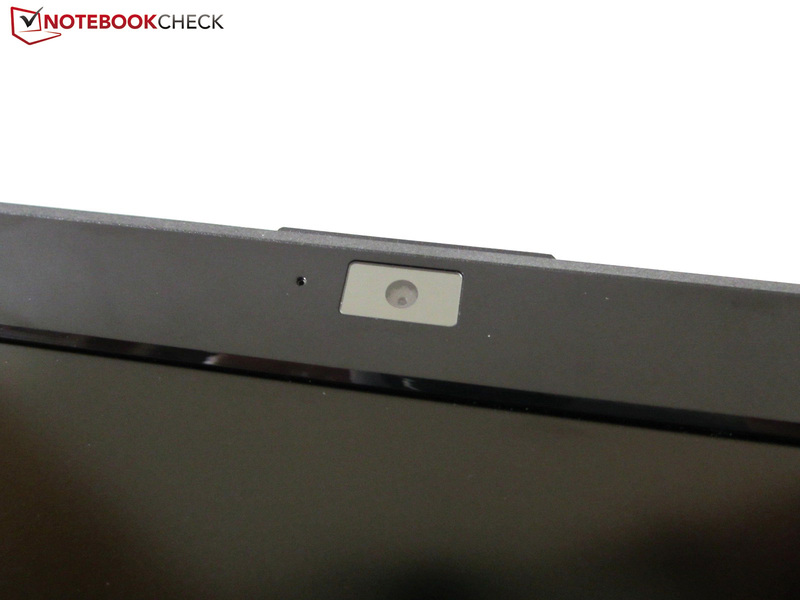 When will the barebone-manufacturer Clevo finally replace the display bezel? Or will we still have to complain about fingerprints and scratches in 10 years from now? 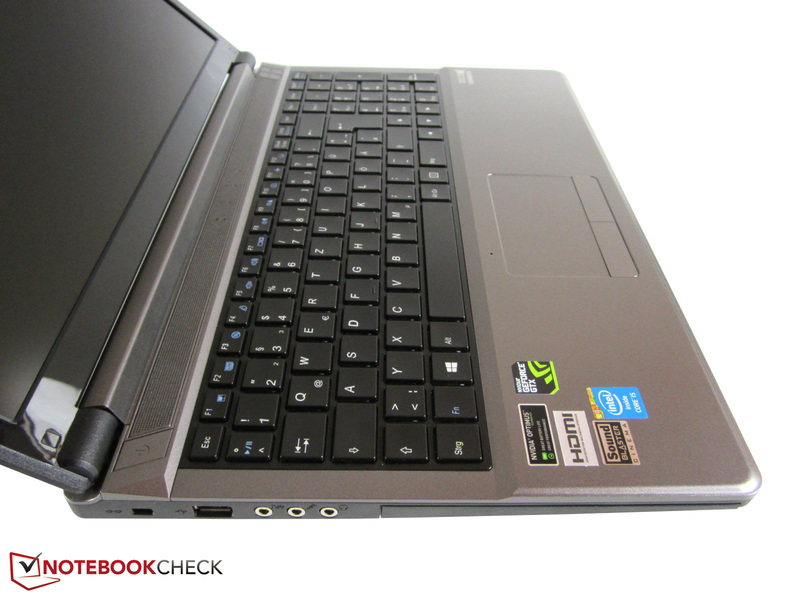 15-inch high-end laptops, such as the Gigabyte P25W, MSI GE60 or One K56-4N.